Exposing the explanatory redundancy of mapping LF to mind-external propositions is thus very much a part of the fabric that the book lays out. The author’s position is similar to the 19th century biologists’ notion of ‘rational morphology’ which involved studying of animal forms sans the external conditions that determine their existence on the evolutionary line, vindicating thus the Kantian notion that existence is not a property of things but of concepts. Though sympathetic to a Gouldian view of interdependency of form and function, Hinzen makes the stronger claim that in some cases a formalist perspective may be more useful to obtain explanatory depth. The three theoretical pegs on which the book hangs are methodological naturalism, internalism and articulation of a rationalist position. I discuss these in the reverse order. Chapter 2 (Against metaphysical naturalism) essentially outlines the rationalistic project from Galileo onwards. The common core of the Galilean method consists, first, of engaging in idealizations and, second, of designing experiments. Abstraction that generative grammar of a language involves attends to the first of these. A deductive methodology and inference from higher principles, the Cartesian addition to the Galilean method, responds to the second. Hinzen furthermore articulates an anti-foundationalist stance by denying experience any role in formation of ideas; whatever theory makes best sense of a larger number of example, wins. Science is thus a way to search for experimental data that match our ideas and not the other way round; in essence, from cause to effect. Minimalism, he asserts, is Galilean science applied to the mind. Arguing against an essentially philosophical view of language, the book denounces the external, shared, public, and norm-governed view of language. Hinzen’s take on internalism and naturalism is embedded in the claim that everything in language development and language change is ultimately the result of processes in individual organisms (Chapter 4: Prior to function). The Fregean concept of objectivity and normativity of thought lies at the heart of analytic philosophy. Given its anti-psychologistic posture, this tradition has laid the utmost interest on every entity external to the mind like propositions and referents but the human mind. It has insisted that a theory or concept representing the world stands in some inherent connection with mind-external phenomena. Hinzen, instead, echoing somewhat the doubts expressed in Chomsky (2000) about the usefulness of the notion of ‘reference’, asserts that existence does not add to the content of our ideas, only to the relevance of using these ideas in the description of our world. In a similar vein, he also criticizes Wittgenstein’s idea of a language as ‘external’ into which ‘internal thoughts, ideas, etc.’ are then translated, claiming, such a concept is not even formulable in a Chomskyan framework; some concepts must be already there, waiting to be selected (Piattelli-Palmarini 1989). Given it is the child who makes a conscious choice of the parameter, the environment "selecting" begs an explanation. However, Chapter 6 (Good Design!) furthers argues against the epistemological view of language and clarifies and strengthens his internalist position by admitting of internal resources (but not representations) of ‘concepts’ which however have no (externalist) relation to mind-external ‘categories’. Existence thus, following Kant, is a property of concepts, and not the other way round. His argument against the externalist position here is primarily presented in two ways, by showing that the purported ‘propositional’ character of phases in Minimalism appeals to an external semantic property and by arguing at length against non-constructivist learning theories. The first objection stems from the phenomenon of “look-ahead” that Minimalism doesn’t seem to be able to get rid of (see Bhattacharya (2002) on this) which leads to a structured NUM (Numeration) containing sub-arrays that make up a phase. For the second, he argues against the most representative claim of an empiricist and externalist learning theory that the content must come from the outside by eliciting the empirical problems with associative learning besides pointing out well-known conceptual difficulties with learning by instruction (e.g., Socrates’ problem). His own vision for learning that takes place inevitably has to do with mental representations (concepts) being semantically individuated which supervene on syntactic categories. Post-Newtonian methodology admits mind as a natural object of study after the ascendance of immaterial forces as a valid object of study. Naturalism, as we understand it in metaphysics (objects being studied) is akin more to materialism (though not materialistic) asserting that the world of nature should form a single sphere, without incursions from outside by souls or spirits and without accommodating abstract or universal values; though without denying consciousness. One naturalist, Hume, even doubted if there’s a material world at all (since everything is constructed through impressions or ideas for him). However, the main thrust of naturalism is in the epistemological sphere (methods used in studying objects): how do we know what we know? Hinzen argues against the analytic philosophical tradition of naturalizing the linguistic mind and rather takes side with the 17th-18th C Enlightenment and Cartesian naturalists by opposing a methodological dualism between the mental and the natural. He points out that generative grammar makes no claims about either psychological/ linguistic reality, absolving us of any guilt of indulging into a kind of linguistics that may not have been psychologically real. His resuscitation of the formalist framework for thinking about human nature is noteworthy as it is a topic much ignored in philosophy. In fact, Hinzen evokes Hume’s idea of the ‘science of man’ which shared this strictly non-metaphysical spirit when he declares that ‘I view him (human nature), including aspects of his ‘reason’ such as his ability to use his faculty of language, as a part of nature.’ Hinzen in fact discovers a rationalistic trait in Hume by insisting that any inquiry into human nature should be classified as rationalist. However, his justification of the importance of human nature by appealing to the idea that syntax can be traced back to bipedalism is premature given that the evolutionary theory of language evolution (Carstrairs-McCarthy 1999, among others) is highly contentious. 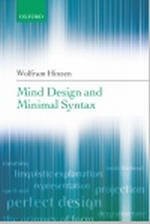 Within Minimalism, Hinzen is first perplexed by the finding (Chapter 5: Beyond the autonomy of syntax) that economy by locality (movement within a minimal structure) is something that neither natural selection nor communication predicts and it seems that this is a part of a generic design independent of language. However, once language is viewed as a natural object in the physical world, it makes perfect sense. Next, he sets himself the challenge to find an internalist motivation for movement in syntax, appealing first to Moro’s (2000) idea that movement is a symmetry-breaking operation. This isn’t novel by itself since the antisymmetry text itself introduces this property of symmetry-breaking right at the beginning where the [[the boy] [the girl]] is shown to be violating antisymmetry (Kayne 1994). However, it’s Moro’s proposal that movement is thus for linearization purposes that Hinzen very quickly, and correctly, identifies as a functionalist logic which has no place in the internalist model that syntax is. This objection can actually be leveled against the whole antisymmetry project itself if symmetry in language is seen as resulting in a breakdown in communication and therefore to be avoided. However, the internalist version that Hinzen himself presents is not very convincing either since it appeals to the possibility that syntax had movement independently and when language became vocalized only the laniaries structures were usable. As we can see, this remains only a possibility, perhaps research in Sing Language will one day vindicate this position. With movement the question of the motivation for internal Merge (transformations) as opposed to external Merge, arises giving rise to the duality of semantics (Chomsky 2002). Hinzen here goes looking for an equivalent in nature (given his human nature project) for the existence of internal Merge and finds one in the shape of secondary RNA sequences creating a loop (as in Piattelli-Palmarini and Uriagereka, 2004), and antibody construction where an intruding antigen is deleted after matching its category, making it strikingly similar to the Agreement system in Minimalism. Thus movement in this ‘virus theory’ will not appeal to any interface requirement (of deleting LF-uninterpretable features, for example) but to a ‘virus infection’. However, the effect of this immunization process that Hinzen finds advantageous, e.g., a semantic effect like binary quantification arising out of the ‘warping’ of a tree, seems to be achievable in any movement theory. Question, though, remain about the lexical level, where syntax does not reign, e.g., the use of words that are names. His response here is that referential features of names are a consequence of their syntactic form. So the problem of syntax applying to single words is in a way overcome. This has an interesting reflex in a language with a classifier system like Bangla, where a single word boi ‘book’ doesn’t have any meaning unless a classifier is combined with it, like boi-Ta, making it referential at the NP level. For it to have a referential meaning at the sentential level, a referential element of the D-level like a demonstrative must show up, with the classifier now attached to the demonstrative. Hinzen’s critique of Bare Phrase Structure is based on the need for a substantive notion of projection for mapping of syntactic objects to emergent semantic interpretations. First, the inherent problem in the model that the head of α and β combining is decided lexically (pushing it back to lexicon) is addressed; and, he suggests incorporating thematic roles into Merge to get the projection to contain the zero-level category. Here, as before, he moves closer to his main thesis of showing that semantics is derivational. Let us consider an example to see this clearly. First, he endorses Pietroski’s proposal that the semantic contribution of binary branching (syntactic complementation) in general is predicate conjunction, for some given event, e. On this view, an example like the following (i) will mean “there was an event e of killing, of which two predicates hold: Jill killed Bill is true of it, and by strangulation is true of it”. (ii) $e such that AGENT(α) is true of e and [e is a Φing and THEME(β) is true of e]. Pietroski, and thus Hinzen, concludes, in a true internalist fashion, that syntactic form determines semantic form. Hinzen however notices a problem with the Pietroski system. An argument, a referential expression, is DP rather than an NP, a predicative expression. The system above strangely type-shifts this argument into a predicate. One way out, Hinzen suggests, would be to view syntactic objects not as hierarchical but dimensional, based upon Uriagereka (2002), from which the containment relations like VP/ vP containing NP/ VP respectively, will fall out. He also conjectures, unfortunately for many of us interested in the project (see Uriagereka interview Part II, forthcoming in the next issue of FOSSSIL News), doesn’t elaborate, that one crucial difference between arguments and adjuncts that only the former requiring labels, falls out of this system as well since for arguments, the fact that they are now composed of semantically two (or more) elements of different ‘types’, must be representationally manifested. Admittedly, though his demonstration of the derivational nature of semantics, going back to the quotation at the beginning of this review, is convincing enough, his linguistic “justifications” against critiques of Minimalism are often rather simplistic. For example, the abstraction that reduced the differences between different construction types was not attempted to overcome, as Hinzen intends, the problems of indeterminacy and overgeneration in theory but was an in-dependent development, though the result may have looked like a “solution” to these problems. Bhattacharya, Tanmoy. 2002. Minimal look-ahead. Yearbook of South Asian Languages and Linguistics 4, London /Delhi : Sage Publication. Carstairs-McCarthy, Andrew. 1999. The Origins of Complex Language: An Inquiry into the Evolutionary Beginnings of Sentences, Syllables, and Truth, Oxford: Oxford University Press. Chomsky, Noam. 2000. New Horizons in the Study of Language and Mind, Cambridge: Cambridge University Press. ----------------------. 2002. On Nature and Language, eds. A. Belletti and L. Rizzi, Cambridge: Cambridge University Press. Jenkins, Lyle. (ed.). 2004. Variation and Universals in Biolinguistics, Oxford: Elsevier. Kayne, Richard. 1994. The Antisymmetry of Syntax, Cambridge, MA: MIT Press. Moro, A. 2000. Dynamic Antisymmetry, Cambridge, MA: MIT Press. Piattelli-Palmarini, Masimo. 1989. ‘Evolution, selection, and cognition: From ‘‘learning’’ to parameter setting in biology and in the study of language’, Cognition 31(1): 1–44. —— and Uriagereka, Juan. 2004. ‘The immune syntax: The evolution of the language virus’, in Jenkins (ed. ), 342–78. Pietroski, Paul. 2002. ‘Function and concatenation’, in Preyer and Peter (eds. ), 91–117. Preyer, G. and Peter, G. (eds.). 2002. Logical Form and Language, Oxford: Oxford University Press. Uriagereka, Juan. 2002. Derivations. Exploring the Dynamics of Syntax, London: Routledge. Williams, G. C. 1992. Natural Selection: Domains, Levels, and Challenges, Oxford: Oxford University Press.